Considered working as an Emergency Room Nurse? This interview will take you through the ups and downs you can expect in the position, what it takes to land the job, what you can expect to earn and more. I work as an Emergency Room Nurse. I don't think I've ever been given a title or maybe it is that I never really cared about the title. I am an Emergency Room Nurse. I actually worked for many years as a Forest Ranger. However, there were government cutbacks and I realized that I couldn't spend the rest of my life out in the forest and actually earn a living. I decided to become a nurse. The reason why I became a nurse wasn't really noble at the time. 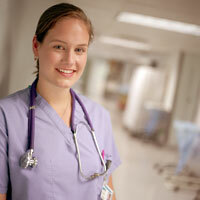 I knew that I could earn a good salary and that I could find a job in the nursing field. I also was attracted to nursing because I like to travel and I knew that I could find a flexible job in the nursing field. Since I was a single guy when I first started my career, I was able to work a few days a week and I had enough money to pay my bills and money leftover to do things. I also found it was a good way to work off the stress because being an Emergency Room Nurse is stressful. Sometimes, my gender does make it difficult. There are people out there that just can't accept a male nurse. I've had people request for a female nurse specifically when they see me walk into a room. I try to not let it bother me. Of course, you have the times where I just feel very inept because I am a male. For example, the lady who came into the emergency room because she was in labor and I was trying to coach her along until they could get her into labor and delivery. I felt very ill-equipped for the job because I'm a guy and I don't have any kids myself. I was very glad when one of my female co-workers came to my rescue! My job is pretty stressful. I do like the fact that it is faced paced and never boring, but sometimes, the stress does get to you. When you are an Emergency Room Nurse, you see everything and anything. Oftentimes, it is on the same night too! However, I think that the flexible work environment makes up for the stress I experience on the job. It is a trade-off. I get paid well to do what I do and that means that I have to accept what comes with the job. I have signed up for a special program where I work 12 hours shifts each day I work. I get paid for a full week for working 36 hours. That leaves me time to travel or do what I want. If I need the extra money, I can pick up a few extra shifts. I did consider being a traveling nurse for a while. But then, I met my wife and things changed a little bit for me. She had a child from a previous marriage and we couldn't just take off any time we wanted. I had to settle down a bit so to speak. I go to work each day because I really enjoy my work. Sure, it is stressful at times, but I love the challenge of it. I really like working together with the other nurses as a team too. It gives me great satisfaction when we are able to come together and solve a problem and help a person in the process. A nurse is really a patient advocate in a way. It is your job to talk to the patient and then to talk to the doctor and to relay concerns and things like that. I really enjoy that. Some of the things that make me want to quit my job are belligerent patients. We had a lady come in here who was a drug addict, and she was pregnant. She wanted to get help for her drug addiction problem, but when we started to get things rolling, she became angry and violent. So you are trying to help her, but she was kicking and screaming and cursing at us all the while we were trying to help her. Times like that are very difficult. She ended up walking out of the ER after a while and there was nothing we could do to keep her there or force her to get help. I still wonder whatever happened to her unborn child. I hope she got the help she needed to make her life better for her and her kid. Sometimes, working in the ER can also be difficult because you never get to see the happy ending so to speak. You get people in, you stabilize them, and send them off. Like the heart attack patient: you stabilize him and send him to the heart specialists. Or, you send the lady in labor off to labor and delivery. Of course, every so often you get to work with a really special family and that makes it all worthwhile. Like the family who brought in their grandmother who was clearly not well. She ended up passing on in the ER. The family was just so close and loved this family member so much. Although it was sad, it was incredibly wonderful to be with them. That sounds crazy to say, but it was one of those life-altering moments for me. I'm not sure I can even put into words why or how it was such a positive experience for me. It was just one of those profoundly memorable life experiences. It is experiences like that which keep me committed to my nursing career. If a friend of mine was considering this line of work, I'm not sure what I would say. I guess it would depend upon which friend was considering the job. Some of my friends quite frankly could not handle the pressure or the blood and guts which literally go along with the job. If I could write my ticket and be anywhere in 5 years, I think I'd like to be on a nursing floor. I really like working with heart patients and maybe I might try to see if I can transfer to the cardiac care floor. I really can't see myself being able to handle the stress and rigors of the ER for a whole lot longer. Then again, I could be wrong. Perhaps I'll be here for the rest of my nursing career. This is a true career story as told to JustJobs.com and is one of many interviews with nursing professionals.